Having founded Savvy Finance a decade ago (when he was in his early twenties! ), it seems that founder and CEO Bill Tsouvalas had wisdom beyond his years. He saw how the market was changing with the way customers seek out finance. It was at that point that he saw a chance to change the system with a new way of seeking out the best deals for his clients. Ten years later, both Bill – and Savvy – are still going from strength to strength. What motivated you to found Savvy Finance? 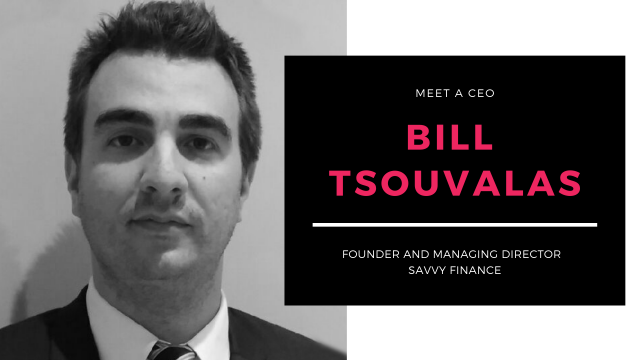 I first set up Savvy Finance in Adelaide ten years ago because I had a clear vision of how purchasing habits were going to change. I saw how finance customers would increasingly shop online but their needs and attitudes would remain essentially the same. They would still favour finance companies they deemed trustworthy provided they offered the best deal and provided the best service as well. That led me to develop Savvy primarily as a one-stop digital car dealership, the place to go for the fastest, surest, least expensive way to buy cars. Car buyers can now navigate the whole process of acquiring a car by dealing exclusively with Savvy. Ten successive years of growth bears testimony to the fact we got it right. Clients can initiate the process by studying data on Savvy’s website about trends in the car market, rankings and assessments of individual cars and the latest movements in resale prices. I figure that our executives have around two minutes into a first contact call from a potential customer to establish the necessary trust. That takes concentrated training and consummate skill, but that’s something our team have in volumes. The chances are that potential buyers are concurrently in contact with other finance companies in order compare the deals on offer, so speed of response and price-competitiveness become decisive factors. At this point we at Savvy have the advantage of being able to check the deals available from 25 of the leading lenders in the country. And we always respond to the customer within 24 hours. How do you go from the customer being interested, to getting them behind the wheel? If the customer wishes to test-drive a car, Savvy arranges it with one of its many affiliated car dealerships right around the country. When the purchase is confirmed, the details and agreement are completed online and we arrange for the new car to be delivered to the customer’s home or picked up at a local dealership. It’s the simplest, most convenient, most competitive and hassle-free way to purchase a car today, and it came directly out of my initial vision, all those years ago. And from cars, Savvy has sprung to other types of personal finance? Absolutely. We’re also poised to expand our insurance and home loans business exponentially. It’s now possible to purchase boats, caravans, machinery or aeroplanes through Savvy in much the same way. A lot of the deals we broker involve multiple components. So, there are better deals to be made if they’re part of a package? Correct. We can provide finance on its own, but the deals are so much better for the customer if we arrange the whole transaction for them. How has Savvy been able to “weather the storm”, as it were, through these years? Finance is a competitive and tricky marketplace. I feel that this is a unique operation, and we’ve built it up through the successful reinvestment of our profits. That, and what I feel is an unfailing emphasis on staff training and refresher courses. I think what I’m most proud of is the staff culture at Savvy. To me, it’s all about providing legendary service, always aspiring to the next level of performance, a sense of urgency, working both harder and smarter, and winning. But it’s important that I do what I can to be humble about it. What it is about your business that gives you the greatest satisfaction? It’s the testimonials from customers. I could have chosen the healthy bottom line or the consistent growth over ten years, or the fact that by the age of thirty-three I’ve built one of the leading and fastest-growing finance companies in the country. But it’s the testimonials that are symptomatic of my regard for customers as the ultimate arbiters of my success. If they believe you’re good enough, you get an order; if they believe you go the extra mile you get a testimonial into the bargain.